This summer, I’ll be teaching Digital Storytelling and Media Arts for the SUNY Empire State College Lebanon Program, with a residency in Cyprus from July 14-20. In the fall, I’ll teach Digital Storytelling (advanced undergraduate level), Advanced Design Seminar (graduate course), and Digital Media Arts and Technologies (graduate course). For more about my courses, see my SUNY Empire faculty site. 3D Avatars created by Dr. Nicola Marae Allain. Last weekend I had a literary Saturday, attending an afternoon Seeing with Words Writing Workshop at the marvelous Hyde Collection in Glens Falls, taught by the lovely and talented poet Marilyn McCabe. That evening, my colleague, friend and neighbor Himanee Gupta-Carlson gave a fascinating talk at Northshire Bookstore on her new book, Muncie India(na): Middletown and Asian America. I can’t wait to read it! We spent Saturday afternoon at the Washington Fairgrounds Raptor Fest volunteering for North Country Wild Care. The photo above features live raptors who are unreleasable due to injuries that compromise their ability to survive in the wild. They are educational animals cared for by the wonderful wildlife rehabilitators Diane and John Hime. Annie is the female Great Horned Owl; Maggie, a female Barred Owl, and Allister, a male Red-Tailed Hawk. I look forward to a fun, productive summer, and hope yours is wonderful. Hello dear readers, it has been a while since I provided an update on my blog. I have been taking a break from social media to concentrate on family, wildlife care, and new work developments. I am currently on sabbatical, and have been focusing on scholarly and creative work. My projects include a philosophy translation and a full length collection ofnarrative poems. I also took up painting, and became a NYS licensed wildlife rehabilitator. 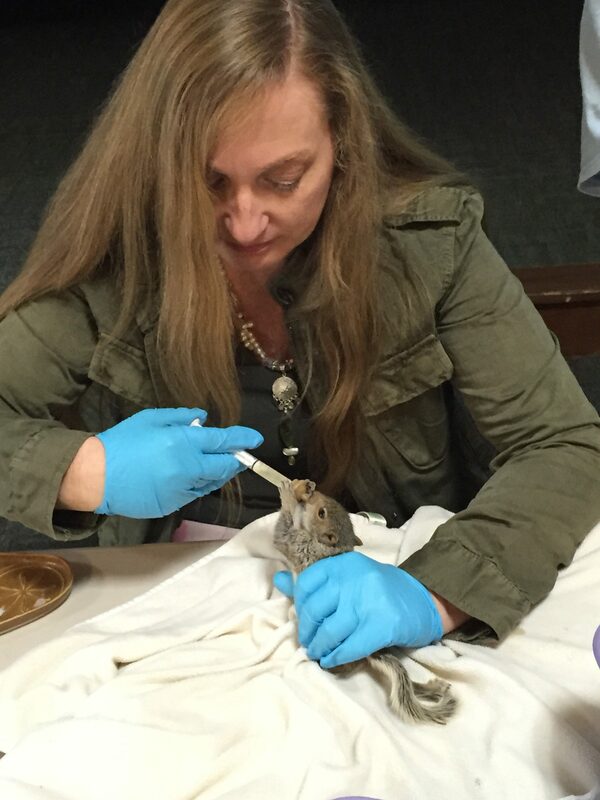 Nicola Marae Allain syringe feeding an orphaned Eastern Grey Squirrel. 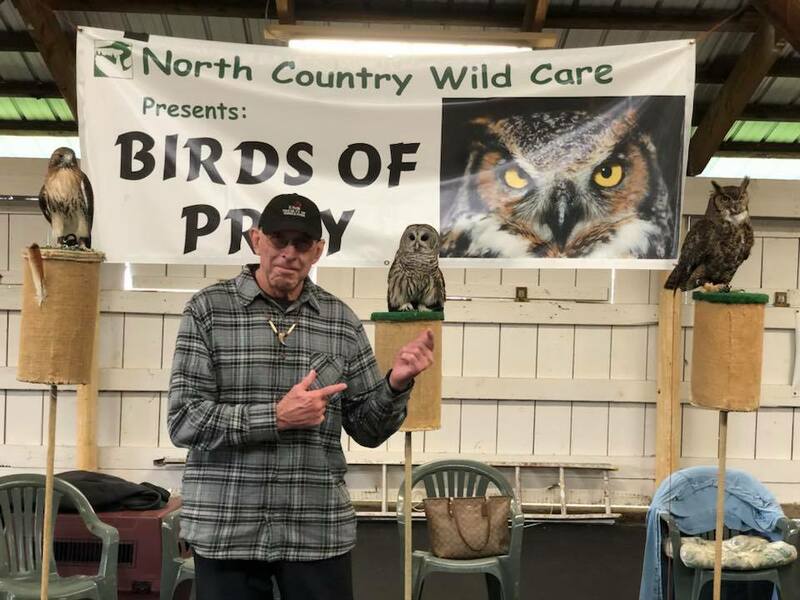 Joseph and I are active members of the wonderful North Country Wild Care organization, and have been very involved in wildlife rescue and rehabilitation. This summer we released 13 orphaned juvenile squirrels, and raised three wild turkey poults. We currently have four late season orphaned baby squirrels in my dance studio who arrived, separately, in critical condition, and needed to be overwintered. I am happy to report they are thriving. We built them a special indoor cage to substitute for the large outdoor pre-release habitat. They will go into the outdoor space as soon as spring weather starts to show. We are also providing winter food support for a wide array of wildlife on our nature preserve and wildlife sanctuary, which is quite an undertaking when temperatures drop or snow falls. We receive daily visits from up to 70 wild turkeys, 2 herds of deer, 25 Blue Jays, 70 Juncos, three species of squirrels, and a variety of winter birds. The other night, an adorable little flying squirrel was sneaking a paw through a feeding hut crack to grab nuts as I put them in. Tiffany, a juvenile female Eastern Grey Squirrel who arrived in very critical condition and is thriving. 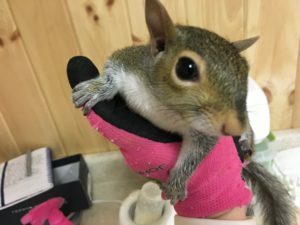 She fell from a tree in Saratoga Springs, and was severely emaciated. Something must have happened to her mother. We are fortunate to have a rich and varied arts community in Saratoga Springs, and are active members of the legendary Caffe Lena, which is newly renovated into a state of the art contemporary folk venue. We have seen some extraordinary musical performances in the past year. Joseph and I both regularly read new works at Caffe Lena’s Open Poetry night. In September, I was a featured poet, and read from the series of narrative poems about my childhood in Tahiti. I’ll be teaching a Tahitian dance workshop for the Flurry Festival on February 17, in the afternoon. I’ll also do a storytelling and dance performance on the Saturday evening. My life is filled with new learning and a deepening of my knowledge and skills in areas of expertise. I find the practice of writing and translation to be best done outside of the influence and constant noise of social media. This said, I do keep up with new developments, and touch base with colleagues every now and then. I am enjoying the ease of doing research using my 2017 iPad Pro 12.9 (an upgrade from the first generation iPad Pro), and haven’t yet decided whether I like my iPhone X, with the loss of the home button and a few other features. I can say that I have an intense dislike for the Apple Smart Keyboard for the iPad Pro. My previous model was paired with the wonderful Logitech Create keyboard and case, which unfortunately wasn’t updated to fit the new iPad Pro. I have been popping in to virtual worlds now and then, enough to keep up with the evolving technologies, especially in relation to avatar embodiments. I’ll be resuming graduate teaching in immersive environments with the Advanced Design Seminar and Digital Media Arts and Technologies in the fall. I’ll drop back by now and then with further updates. Thanks for reading! Joseph and I married on June 18 in a non-traditional interfaith ceremony, reflecting our roots in indigenous Polynesian and Native American traditions. The wedding was held outdoors, under a pine and flower arbor, on a hill overlooking the beautiful grounds of the Ndakinna Education Center in Greenfield Center, New York. The ceremony began with “the words spoken before all others,” the Thanksgiving greeting giving thanks and acknowledgment to all Creation offered by Mohawk elder Tom Porter Sakokwenionkwas, followed by a shamanic calling in of the spirits and introduction of the grandmothers by Shari Parslow. The grandmothers were represented by my mother, Lovika De Koninck, my aunts Anne-Marie Coad and Moira West, Mohawk storyteller Kay Olan, and my friend and colleague Julia Penn Shaw. Joseph, his sons Jim and Jesse, and grandson Jacob sang the Abenaki greeting song after the opening address. They wore matching traditional ribbon shirts in black, green and red, beautifully crafted by the talented Joanne Mason. Reretava Tahitian dancers Joanne Mason, Whitney Luedtke and Naima Burnett, wearing spectacular orange and red costumes with flower crowns, followed with a traditional Tahitian drum dance, Vahine Tahiti, with music by my son Mikaël Mulholland. Mikaël also composed the original song for my entrance dance, which preceded the formal part of the ceremony, and joined me under the arbor to give me away. Our vows were administered by our dear friends Joseph Kulin, a Quaker elder, and Pierre Zimmerman, an ordained Buddhist chaplain. My sister Kareva Mateata Allain joined us under the arbor to wrap us in a stunning star quilt (from the Standing Rock Lakota Sioux Reservation in North Dakota) to symbolize our bonding. As the closing of the ceremony, Mikaël Mulholland and Joy MacKenzie sang the traditional Tahitian song Bora Bora as the dancers and I performed an ‘aparima – a storytelling dance. Joseph’s lovely granddaughters Carolyn and Ava Rae led the procession after the ceremony, and we all walked down the aisle together, we the bride and groom, with our 3 sons, grandson, granddaughters, and close family friends. That was my favorite moment of the ceremony. 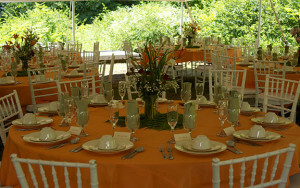 Our friends from Sushi Thai Garden catered a fabulous feast featuring Polynesian, Japanese and Southeast Asian foods. Local singer/songwriters Bob Warren and Joy MacKenzie provided entertainment after the meal. The Friday before, we enjoyed a wedding rehearsal dinner at the lovely Forno Bistro in downtown Saratoga, balanced by an after-wedding family brunch at the spectacular Gideon Putnam hotel in the SPA State Park. Joseph and I then headed to Canada for a lovely honeymoon in Montreal, Quebec City, and Rivière-du-Loup. So much has happened since I last wrote. My nephew Justin and his lovely bride Gina married in a traditional Tahitian wedding ceremony in Papara, Tahiti in October. Joseph and I had a wonderful time at the wedding, visiting with my many family members in Tahiti, French Polynesia. We also had a lovely dinner with the Tahitian author Rai Chaze, visited cultural sites, and spent time together in a little fare (Tahitian bungalow) on the beach in Faaone, one of the more remote communes (town/district) that is still very much like the Tahiti of my childhood in the 70s. Joseph proposed on the return trip home (I said yes, of course)! 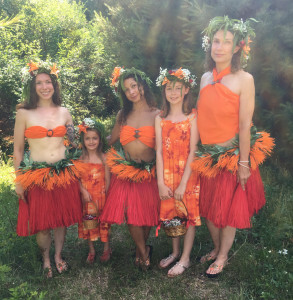 We’ll have a non-traditional interfaith ceremony in June, reflecting our roots in indigenous Polynesian and Native American traditions, incorporating elements of Tahitian and Abenaki music and dance. 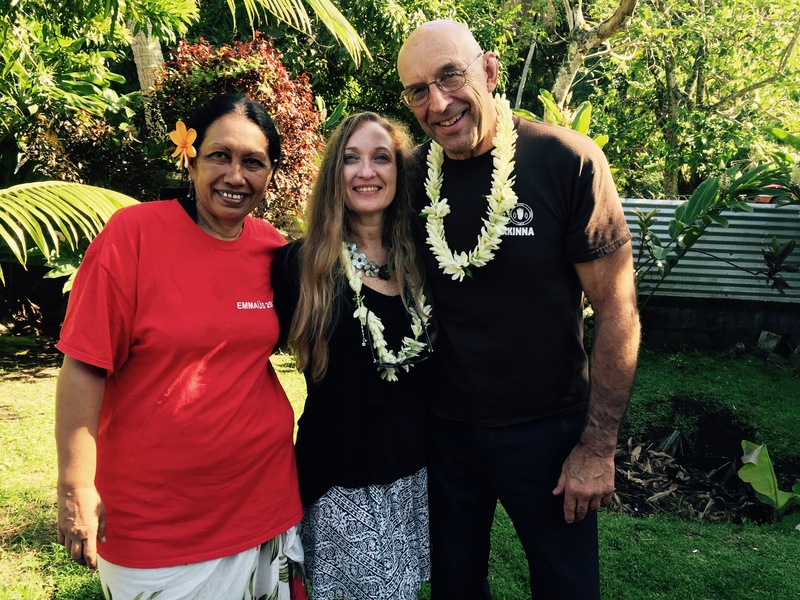 With Joseph and my cousin Emilia after our arrival in Tahiti. In November, Joseph and I visited the First Nations Reserves in New Brunswick, Canada, on whirlwind tour from town to town across the province. Warmly received by the Maliseet and Mi’kmaq communities, we were honored to share stories while feasting on traditional foods. Joseph and I both participated in programs at the University of New Brunswick, in Fredericton. I gave a talk on Teaching & Learning in the Digital Age, for the Center for Enhanced Teaching and Learning. We visited Montréal, Québec City and Rivière-du-Loup during our journey. I spent several years in these cities during my late teens to early adulthood, and still very much appreciate the language, culture, landscape and people of the province of Québec. 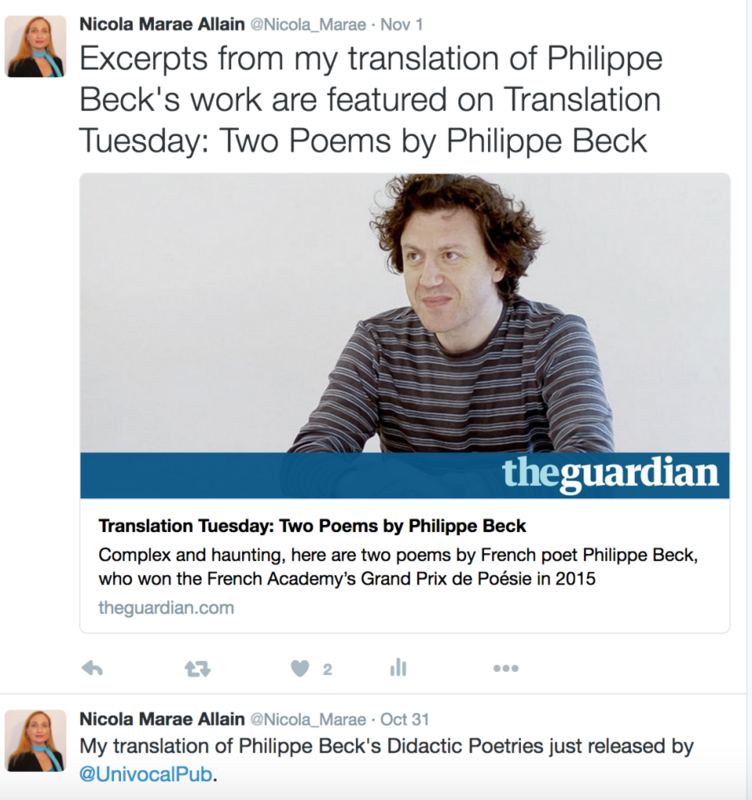 In the meantime, before and beyond, I devoted every spare minute completing my translation of the French poet Philippe Beck’s masterpiece, Poésies Didactiques. A labor of love and five years’ scholarly focus, my translation is forthcoming this fall, as a Univocal publication. As stated on the book site, Complex, haunting, imaginative and profoundly literary, Didactic Poetries is Beck’s response to Schiller’s statement: “We are still waiting for a didactic poem where thought itself would be and would remain poetic, ” and Hegel’s claim that, “strictly speaking, didactic poetry isn’t poetry.” Beck’s deftly textured poems interweave contemporary commentary with cultural, historical, literary, and philosophical allusions, drawing the reader into a world of lived poetic experience. For a full description of the book in translation, see: http://www.univocalpublishing.com/univocal-books/didactic-poetries. Cruz, Irene. Integration of a (LMS) Learning Management System with a (VLE) Virtual Learning Environment for ESOL/EFL Adult Learners. Steenburgh, April. An Examination of Digital Literacy Training Through Immersive Environments. Brown, Dave. An Exploration of Assessment Attitudes and Interaction Factors Within XMOOC Learning Environments. A research case study. Hernandez, Doris. Dream Fusion: Immersive Innovative Pedagogical Design For Artistic Engagement Using Emerging Technologies. Barkevich, Sandra. Unleashing the Storyteller Within: Using an integrated Learning Theory and Multimedia Approach to Designing a Digital Online Creative Writing Workshop. Shapiro, Phyllis. Creating an Active Learning Environment that Aligns to a Fashion Student’s Career Interests and Goals. In addition, I have been teaching some very interesting studies in dance, and working with international dance students. My home dance studio is now complete with custom-installed dance mirrors, a bamboo floor, and a lovely ash ballet barre. 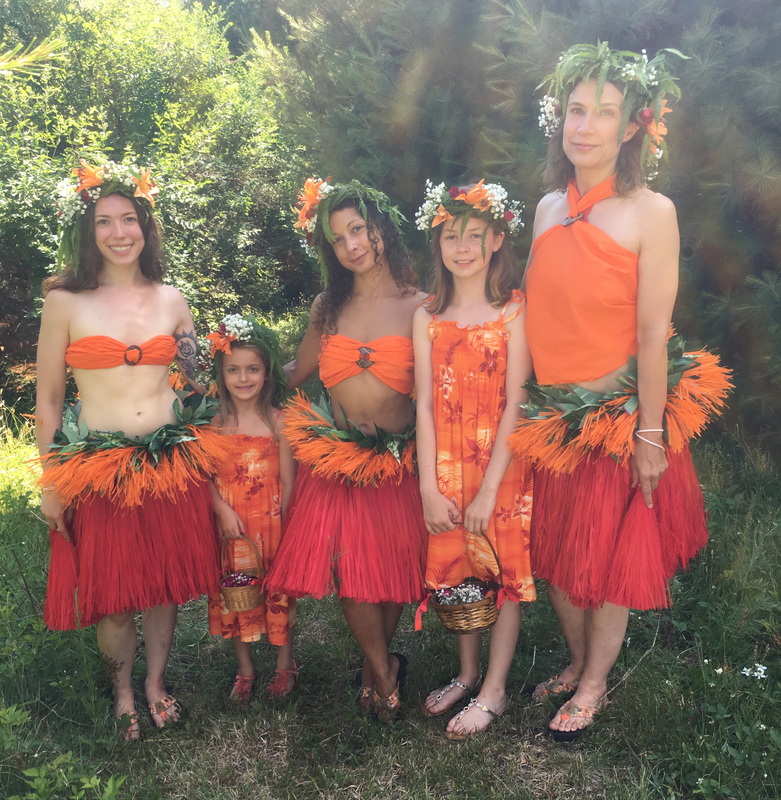 I started a new Tahitian dance company, Reretava Tahitian Dance Company, and will write about my new developments in dance in a future post. Until then, be well! Enjoy the lovely spring and summer weather and the bounty it brings. There is something about September in Saratoga Springs. The ethereal light quality reminds me of Paris in April. Deeply textured, bright yet soft, beautiful. Late summer flowers are blooming, and apples and pears fall heavily from fruit-laden trees. Throngs of tourists quietly start to thin as the racing season comes to a close. On Friday, Joseph and I went to see The Kennedys in concert at the legendary Caffe Lena. This was a brilliant performance by two fantastic musicians. I was particularly enthralled by Pete Kennedy’s rendition of Gershwin’s Rhapsody in Blue on the ukulele. Such musicianship! On Sunday, we decided to take our lovely Maltese dogs for a walk down Broadway during the Final Stretch festival. The streets were brimming with live music and jubilant revelers intoxicated from a particularly exciting racing season – due largely to American Pharaoh’s triple crown win (and subsequent loss to long shot Keen Ice in the Travers). We ran into friends starting a set singing for the Racing City Chorus, and were offered front row seats to a lively a cappella performance. Dixieland tunes drifted from down the street, adding quintessentially American flavor to this delightful event. The academic term begins in this energizing atmosphere. Though spring is often the time of renewal, that special something about Saratoga brings a quickening, a livening, with the crispness of the air carrying clarity to the mind. Courses opened to students this week. I’m teaching the Advanced Design Seminar for students in the Master of Arts and Learning Technologies program (MALET), which is always engaging. I have an advanced student working on a study in Immersive Virtual Learning, and a dance student in Dance Criticism. I am also serving as thesis supervisor/first reader on five master’s thesis projects, ranging from assessing MOOCs to developing immersive learning environments for digital literacy, English as a Foreign Language, teaching creative arts, and digital storytelling. 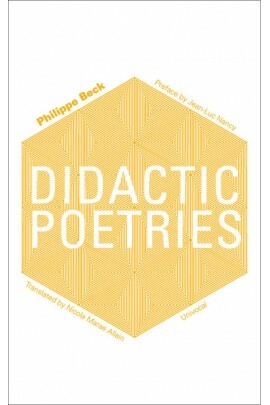 In terms of scholarly projects, I’m completing the translation of Philippe Beck’s Poésies didactiques as the publishing deadline approaches. I’ll keep you informed about these advancements, and my upcoming travels in future posts. In the meantime, I wish you a lovely summer’s end leading to a great start to the fall. Greetings, Friends. My website had issues this summer, and the blog posts from previous years are no longer available as archived files. I might make a separate archive for them, though. Check back for that if you’re interested. I have some fabulous photos embedded in those old posts. I was able to keep my prior pages, though, and will soon reload the images that go with those. This is a year of major change for me – new romance, and I moved to a beautiful wilderness setting in the foothills of the Adirondacks. My iPad Mini Retina Display’s Personal Hotspot is sharing its cellular data connection with my MacBook Pro in lieu of a wireless link. Oh, the marvels of modern technology! 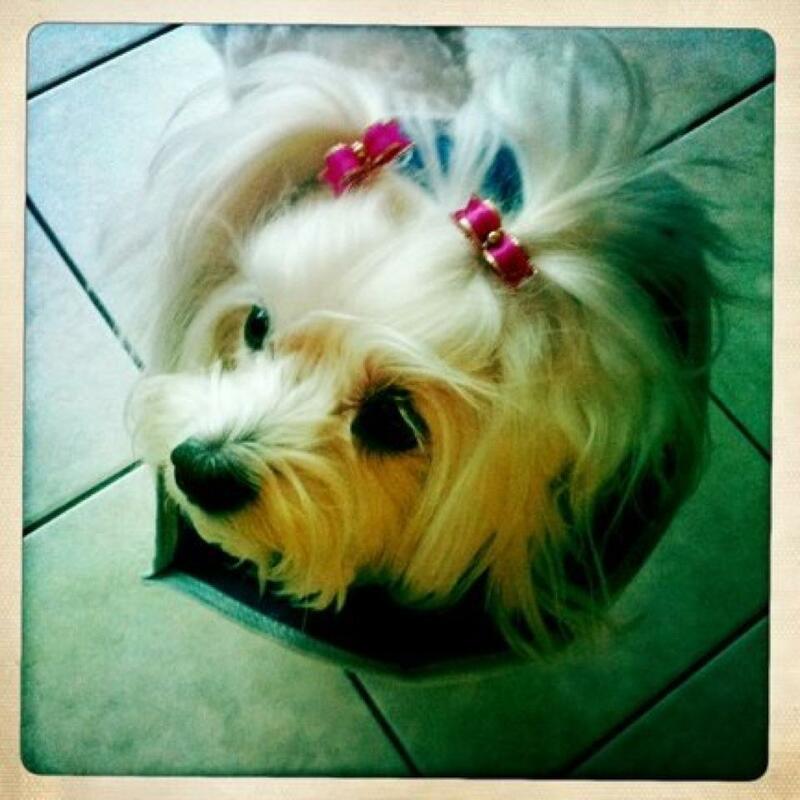 On a sad note, my lovely little Maltese dog Sylphide passed away from congestive heart failure after a long battle with chronic illness. She was just a month away from her 12th birthday. I’m very grateful for the wonderful years we had together. Sylphide received remarkable care from Dr. Joy Lucas at Upstate Animal Medical Center, and enjoyed a full, happy, healthy life until the end. Those of you who had the pleasure of knowing this beautiful, confident little being saw how special she was. Her ashes are buried in her favorite spot near the cabin. May she forever walk the forest trails she loved so dearly. When I have the chance, I’ll post a short video of her merrily leading the way just weeks before her passing. A new term is about to begin at SUNY Empire State College. I’ll be supervising some interesting master’s thesis projects, most with an immersive learning component (but each with a different primary focus). I’ll post again soon to provide details on the emergent work we are doing in the Master of Arts in Learning and Emerging Technologies. Until then, may you enjoy summer’s end.